We spent the day packing gear onto the sled that will be towed by the Everest tracked vehicle across the ice to Lake Untersee. We made pretty good progress today and we plan to begin the 125 km traverse early tomorrow morning. Hopefully we will be at Lake Untersee by about 2pm UTC. For the moment we are still enjoying nice weather with clear skies, warm temperatures and little wind and if we are lucky this will be the case when we head to the lake tomorrow. Once at Lake Untersee we will beging putting up tents so if the weather becomes inclement we will have refuge from wind and blowing snow. 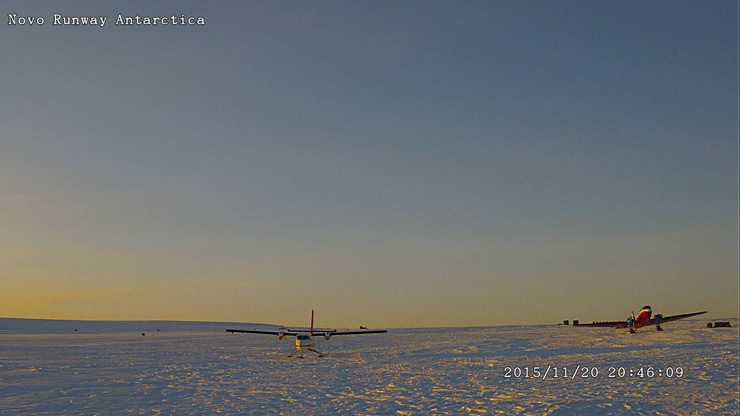 In good weather it usually takes us about three days to establish the camp - in addition to putting up the various tents we need to drill a hole through the lake ice for drinking/cooking water, get the lab and dive huts set up and beging melting dive holes. We also left sensor arrays in the two basins of the lake which we will retrieve, download the data and redeploy. So needless to say once we are onsite we will be pretty busy - but that is why we are here, and everyone on the team is ready to start working on the science! More soon, hopefully from the shores of Lake Untersee.